The Dates for this amazing tour are from Saturday 8th of September through to Saturday the 22rd September 2018. Patricia’s background is in Fine Art and Design and worked as a Designer and Dressmaker for her own fashion label. 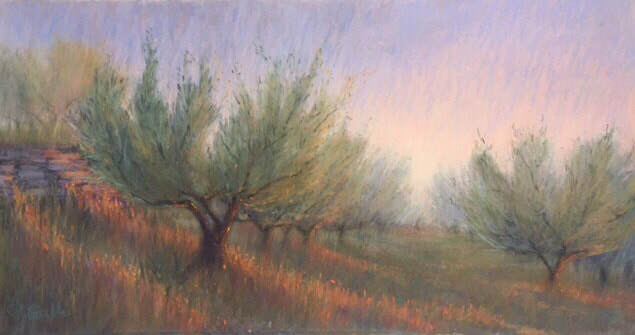 She further developed her artistic skills attending many classes and workshops with many prominent Artists, working in various mediums, including pastel, charcoal, water colour and oils. Patricia has participated in a wide variety of art events and private shows, receiving many awards for her work. She was awarded the 2014 Kenneth Jack Drawing Award and recently the Doncaster and Templestowe Artist Society “Best Pastel” award three years in a row. She is a signatory member of AGRA (Aust Guild of Realist Artists), and a member of The Vic Pastel Society, Pastel Palette Artists, Doncaster Templestowe Art Society and Warrandyte Arts Group. Painting and sketching en plein air (out in open air) is an important part of her artistic practice. Her sketch book is never far from her side, as she likes to record her impression of the places she visits. She then further develops these quick studies in her studio, producing works that have a sensitivity that often evokes an ethereal feel in her paintings. Her Italian heritage has taken her on frequent trips to Italy to paint and features regularly as the subject of her paintings. She has taught Pastel painting and drawing at the Manningham Arts Center and currently runs workshops in the Art of Travel Sketchbook Journaling. With Patricia, you will be visiting some of the most beautiful villages and towns in Tuscany, where you can leisurely explore the streets for some sketching, photographing, shopping, sightseeing or simply sit in a cafe and absorb the local atmosphere. You are free to choose how you want to spend your time. For those interested, you will be guided with demonstrations and enjoyable exercises, using a variety of mediums and techniques, to build up your experience and confidence in sketching outdoors, capturing and recording memories of your travels. "Tuscany was as unexpectedly as beautiful as I'd dared to dream, our accommodation beautiful, comfortable and typically Italian; and our hosts treated us like kings. However the trip would not have been the trip it was without tuition, organisation and consideration. I had not painted in water colour since I was at school [too long ago to mention] and I have 2 paintings on my wall now to prove the tuition was good, even if I do say so myself. We were laughing heartily every day. All in all I can highly recommend the tour and Tuscan Sun, and I am tempted to do it all again this year- just don't tell my husband. Painting workshops will be conducted every second day (except for Sunday). On the alternate days there is the option to spend your free time painting or enjoy a full day tour to one of the many amazing places within an hour and a half drive. Mostly these are places where you can comfortably spend the entire day, such as Siena, Florence, Assisi, Perugia, San Gimignano and the Chianti region plus many more! Sufficient time will be available at each destination to thoroughly explore and/or paint. The daily program will be flexible to accommodate everyone's needs. On other days, free time can be spent closer to home, at the weekly markets perhaps, both at Cortona, Castiglion Fiorentiano or around lake Trasimeno or even out walking in the spectacular Tuscan countryside! During your fortnight with us, we will provide all your breakfasts and 8 absolutely delicious home-cooked evening meals! On the other evenings, we encourage you to try a few of the local eating places and experience some of the Tuscan fare. However, the fridges are not locked at night! Transfers to and from the local railway station are provided as is local transportation. Every assistance is given to help you reach us as easily and painlessly from most international airports and railway terminals. (includes accommodation, meals and transfers as detailed here).